Software are mainly the visible interface of our control systems. The emphasis is put on interactivity and real-time monitoring. Please us the in-line form if you have any suggestions or trouble using our applications. This application comes standard with our systems. The basic version allows you to view signals in real time and configure the functionality of modules. The advanced version allows to record signals and perform post processing on recorded files. Last update : Version 6. New functionalities. Automatic history, long-term display (up to 10 days on the same screen), graph output with axes in various formats (eps, wmf, bmp), full screen display, new end synchronisation option. Acquisition enables synchronized recording with automatic backup and remote monitoring options (from any PC connected by network control system).. This application can be configured to start automatically with the PC and usually requires no intervention. Recorded signals can be replayed in aDDa-V software, processed and exported. Analyse task is to load automatically and vectorize the data from each production cycle. 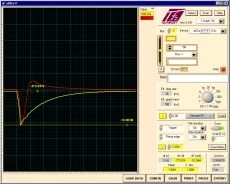 Vectorization of signals is comparable to the metrology performed on a part. From an intuitive description of desired results (what to measure) "Programming" interface generates an analysis code. Characteristic values of any type of signal can therefore be extracted automatically (maximum slope, event, area under a curve, etc..). This program can handle a large number of complex signals and convert them into a single vector (array) per part. This allows to perform comparisons (for instance SPC - Statistical Process Control). TFX SA assists and advise its customers to provide the most pertinent and most representative parameters of their process. The data generated can of course be used for further statistical treatment (multivariate analysis, principal components or partial correlations). This tools allows for example highlighting of correlations between observable defects and controllable parameters. According to customer needs, these analysis will be performed by our expert team, or integrated in dedicated software tools on demand. Display is originally designed for real-time monitoring of mass production processes. By interfacing it with digital production tools: press module (interception of statistics pages, or for example Euromap 63 data), marking systems (serial numbers of parts enabling full traceability), our software map every part produced and allow continuous monitoring of the process. With minimal documentation, we are able to interface and integrate any type of information (digital communication, or operator interface). Display includes the possibility to enter information related to material batches, a logbook process to supply history data (Lean manufacturing white board) and OEE (Overall Equipment Efficientness). Module Tests - Design of Experiment. The input parameters entered on the flight, testing conditions and measurements (quality controls) are coupled with real-time analysis of signals in order to return a complete synthetic matrix as soon as requested. This represents a huge time savings and let people concentrate on the results instead of processing. Version Control laboratory. Coupled with a testing machine, each formula or batch can be analysed systematically with an inspection report as result. The entire data history is available for further analysis. Associated with the Display software, Reporting is designed to navigate in production history and search as a needle in a haystack the production conditions (all recorded parameters) of a given part. The interface is specially designed to set the controls and limits, estimating the quantitative effects of limit thresholding. It provides also all necessary statistical information regarding available data. New application dedicated to quality controls and trials. Based on MySQL database. Automatic Analysis and Report generation. New interface with direct input of parameters. Complete Matrix export for further statistical analysis.